LEGO NinjaGo: Masters of Spinjitzu is an animated series that follows the adventures of four ninjas as they fight against evil. Of course, the show is based on a popular line of Lego toys featuring the same ninja characters and the villains seeking to thwart them. In many ways the show uses the good versus evil theme as a basis for teaching small lessons with each episode. The series takes place in Ninjago, which is a mystical world of dragons and snakes. The underworld of Ninjago is ruled by Lord Garmdon and his skeleton army. The four ninjas frequently do battle with the evil doers, and are often aided in battle by magical weapons and their friends. 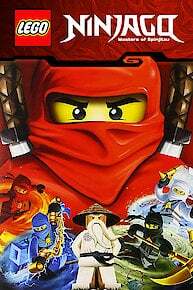 The four ninjas, Kai, Zane, Jay, and Cole, each have a special ability to control one of the elements, and the team has even taken in Lloyd, a small boy who is the son of Lord Garmadon. Of course, the family dynamic gets even more complicated when Lloyd is revealed to be the legendary green ninja, who can control all of the elemental forces. The series is a colorful take on myths and legends, and in true animation style often uses comedy and over-the-top visuals to advance the storylines. The show manages to give each of the characters a fair bit of screen time, which is handy since each of the ninjas have a unique backstory. Of course, the show spends just enough time developing stories as it does showcasing action sequences to keep young viewers interested. At its core LEGO NinjaGo: Masters of Spinjitzu is a series that teaches lessons like trying your best, never quitting, fighting your fears, and doing your best no matter the circumstances. Like many animated series before it, the show strives to make its characters better by growing them emotionally through every episode. The characters have many of the same experiences that many viewers can relate to, which is why it offers a wide appeal to a variety of age ranges. The headquarters of the resistance is breached and Lloyd scrambles to avoid capture. Meanwhile, the Ninja are caught by Heavy Metal, but find an unlikely ally. LEGO NinjaGo: Masters of Spinjitzu is currently available to watch and stream on Cartoon Network. You can also buy, rent LEGO NinjaGo: Masters of Spinjitzu on demand at Amazon Prime, Netflix, Amazon, Vudu, FandangoNow, iTunes online.